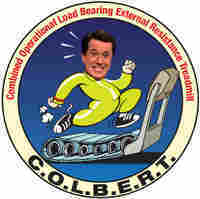 NASA Names Space Station Treadmill After Colbert The space agency solved its latest public relations problem. NASA invited people to send choices to name a room in the international space station. TV comedian Stephen Colbert got his viewers to offer his last name, and they won. An astronaut told Colbert the agency compromised by renaming a treadmill. A patch designates the Combined Operational Load Bearing External Resistance Treadmill. The space agency solved its latest public relations problem. NASA invited people to send in choices to name a node in the international space station. TV comedian Stephen Colbert got his viewers to offer his last name, and they won. An astronaut told Colbert that the agency compromised by renaming a treadmill. 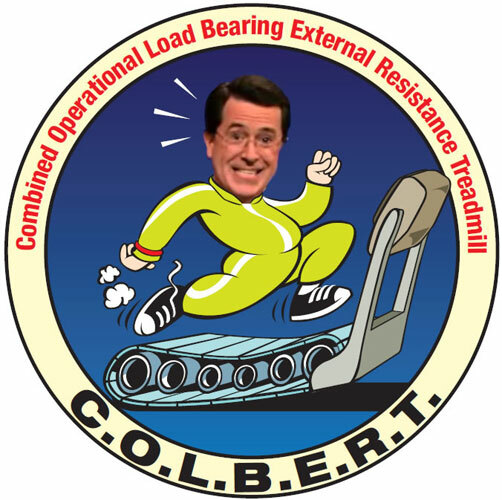 They gave it an acronym: Combined Operational Load Bearing External Resistance Treadmill — that's C-O-L-B-E-R-T. The treadmill is set to arrive at the space station in August. It will be installed after the node, named Tranquility, arrives at the station next year.